We’re big fans of plant-based burger restaurant The Vurger Co in Shoreditch, so we’re pretty excited about this amazing new collab with Gaz Oakley aka Avant Garde Vegan. 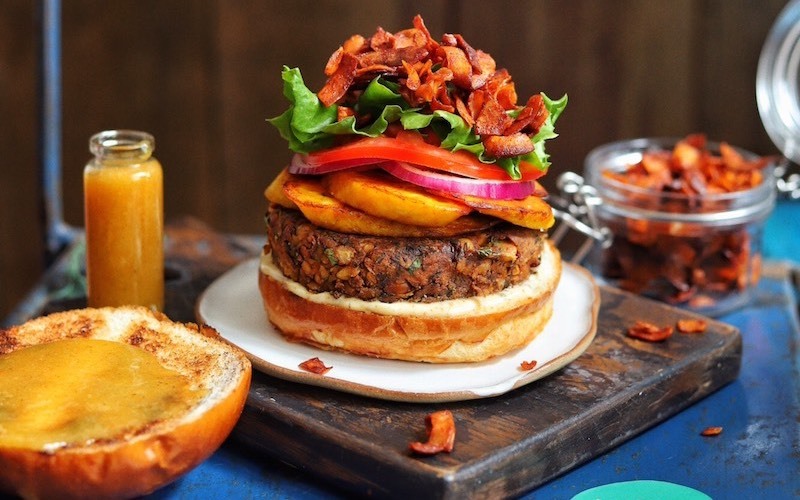 The Kicking Caribbean Burger features a jerk-spiced hot pepper bean patty, with deep fried plantains, house-made mango ketchup and coconut bacon bites. With nearly half a million YouTube subscribers and a hefty following on Insta too, Gaz is one of the biggest figures in the UK’s vegan scene, so this is sure to be one bangin’ burger. It’s only available for a month, so don’t hang about if you wanna get your chops around this spicy bad boy.